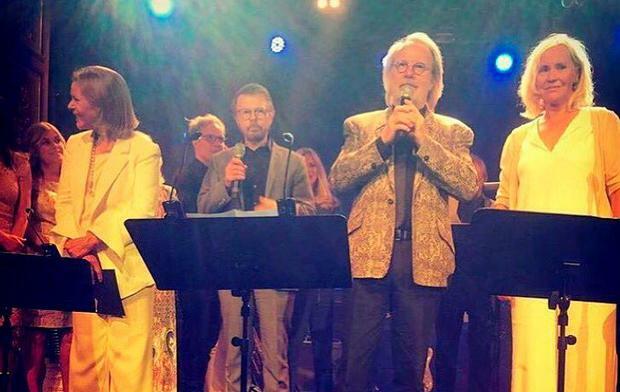 Look who's back - ABBA reunited on stage last night to celebrate Björn Ulvaeus and Benny Andersson's 50th anniversary as friends. The four musicians celebrated by throwing a private party in Stockholm, with an exclusive guest list. And they've almost broken the internet - with the majority of fans waiting with bated breath for video footage of the show to emerge. Eurovision Song Content scriptwriter and director caused a stir when he tweeted an image of the reunion, writing: "Wow! Last night history was made. ABBA finally reunited. All 4 on the same stage, singing together." Looking a little greyer than their hey-days in the seventies, the foursome certainly didn't disappoint with their performance. It was 50 years ago on June 5 that Bjorn and Benny met for the first time, and little did they know that they were about to go global. And it wouldn't be ABBA without Agnetha Fältskog and Anni-Frid Lyngstand, both of whom showed up at 6.15pm and kept the party going into the early hours of the morning. "It was absolutely amazing," Anni-Frid told Swedish publication Expressen. "A lot of emotions. We've made this journey throughout our history. Benny and Björn in particular. Its been very nostalgic." Paul McCartney was among those who sent the band a 'good luck' message on the night.